The computers models show that as CO2 increases, water vapor (a much more potent Greenhouse Gas) will increase rapidly, yet this is not happening, why? Also note that the world was much warmer than now in the 1200s, must have been all those cars! In the 1850s world temperatures started back up (snow in London where there is generally rain). This mini "Ice Age" started in the 1400s and really got going about 1570 (see Frobisher's journal). The mid 1600s is when the well known "year without a summer happened"
World temperatures may no longer be increasing. Data collected in the Great Britain show temperature in the troposphere is virtually unchanged since 1979 if volcanic eruptions and El Nino events are taken into account. And currently the trend has been towards more extremes if you look at the facts. The Northern Hemisphere is in one of the coldest winters in decades, it snowed in LA where it has not snowed since the 1950s and here in the low valleys of Southern Oregon we have snow on the ground for almost two weeks when the longest is usually ½ day. Meantime in Australia where it is summer, they are experiencing extreme heat wave. These are called climatic cycles. It is also interesting that all the charts I have seen only go back to the 1850s when global temperatures bottomed out, Al Gore and his dishonest America haters never show charts beyond this time frame. Another point is what is the horror anyway of a few degree warmer temperatures? In the Medieval Warm Spell grapes grew in England where they will not today. Also the Earth is amazing in how regulates itself climatologically. Hurricanes are natures (God’s in my view) cooling system. An average hurricane vents heat high into the Stratosphere cooling the Earth’s surface, especially in Equatorial regions. Hurricane severity also ebbs and flows along with other aspects of climate, the last two years were great examples; 2005 being a really active year, while 2006 was one of the most quiet in many years). As for the scientist all agreeing, this is a farce as there are certainly plenty plugging this to get more grant money and find more ways to hate the USA, but most who agree are not even Meteorological Scientists. You really just need to follow the money trail, Carbon credits to Third world countries are simply taxes on the USA and other Industrial Nations. "In 1995, I published a short paper in the academic journal Science. In that study, I reviewed how borehole temperature data recorded a warming of about one degree Celsius in North America over the last 100 to 150 years. The so called "consensus" is just that, so-called. Many scientists who disagree are black listed. Many weather persons are accepted into umbrella organization for weather forecaster if they disagree. 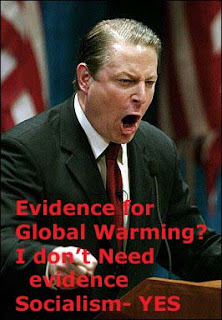 Global Warming is the “New Communism” in the world in the way it is conducted and how facts are quelled. A while back in history there was a scientific consensus that the earth was flat, that is until Gallileo came along and finally proved otherwise. *Water vapor is a vastly more common Green House Gas than CO2. Water Vapor absorbs infrared radiation at wavelengths of 4.26 µm which will trap heat. *CO2 is a very minor part of our atmosphere (0.0384% as of 2007) and even with the increase (which no honest person denies), it will have little impact on global temperatures as stated above water vapor is much more common and effective Green House Gas. One Volcanic eruption can dump vastly more CO2 than 100 years of man made CO2. *Studies in Antarctica (as well as many other places, including Mt Shasta in the USA) show the ice sheet growing, not retreating. Most articles make it sound as if all of Antarctica is melting. As far as I’m concerned, these reports are misleading, because it's mainly only the ice on the Antarctic Peninsula that's melting. Data clearly shows that the Sun is in a state of unusually high activity, for about the last 60 years. The time interval for which this statement can be made has been tripled by these new investigations, for now the reconstructed sunspot numbers extend back to 850 AD. Another period of enhanced solar activity, but with substantially fewer sunspots than now, occurred in the Middle Ages from 1100 to 1250. At that time, a warm period reigned over the Earth, as the Vikings established flourishing settlements in Greenland. This Global Warming report is the biggest sham forced down the public’s throat in my lifetime. I am an amateur meteorologist who also loves history and this history is totally ignored in these bogus reports. This report was just more inflammatory rhetoric without any real facts (including historical facts other than charts that show warming since the 1850s (which no one denies). Why does news media not seek out the real facts, money trail, and drive for socialism that fuels this false hysteria? I have never seen good results with our Adwords content ads and as I have investigated and searched the Google network I know why, the content they (Google) placed these ads on is very poor. I have found ads for Shell wind Chimes on blogs with nothing more than some alluding to wind in their blog. But the worst part is quality sites such as my own (I know this from VERY positive feedback) are turned down for Adsense ads. My website has a lot of content, good PR and has been around a while. Apparently Google figures there is a better chance of clicks on these sites as frustrated readers are looking for more than someone’s life editorial, which is why my 'clicks' are high but conversions are almost nil. This is business corruption at its worst and quite frankly if it were not for the fact that Google is the 800 lb. Gorilla where by I must be present with adwords to be noticed in searches. I would not advertise here at all, and at that I try and keep my advertising budget to the bare minimums with Google based on Google' business practices and place more ads elsewhere where there are more business morals in place. What bothers me too, is that with so much corruption in business (and other aspects of life, from Religion to Government), is that nobody gives a #@1# about Google's business moral, or lack there of. In another blog I commented about the fact that Google has gone to one extreme of business management (as many business treat there employees like dirt), they tend to treat their employees as royalty to a point that they look down on anyone who questions anything about the "great and mighty Google" when I have tried to fix things from Google Adwords, to Blogger, to Google CheckOut, to the most corrupt bunch at Google; ADSENSE. By the way I think the ideas behind many of the before mentioned Google products are good, especially Blogger and Google CheckOut, it is just how Google handles them and treats customers. In this comment I made, someone came to the defense of Adsense claiming how many little people have made a living or at least part time revenue from Adsense. What about businesses such as mine that have been ripped off in the content network and also have had Adsense accounts taken from them (including pending earnings) after Adsense disabled their account when someone got bored somewhere and decided to go on a clicking frenzy? Google has the technology to detect these fraudulent clicks computer addresses and remove them and needs not do the heavy handed disabling of a legitimate business, which of course Google Profits from. I guarantee you if someone went crazy and started clicking a high PR pet site of Googles such as http://www.cadenhead.org/workbench/, Google would NEVER disable this account (which I can bet delivers a lot of revenue to Google Adsense). Also I have had many of my Aquarium research articles ripped off by others only to display Google Adwords and these plagiarized articles ONLY place high in Google Search, not MSN or Yahoo (go figure, huh) which spot these rip offs much better than Google. I could go on more about the many lies as to link relevance an other aspects of Googles search engine which are all directed at maximizing profit at ALL costs, no matter how dishonest the results. I will someday post more about this subject. This post was found at this blog: "Aaron Swartz; sociologist in exile". His blog "Raw Thought" has some interesting reading and comments, not many I agree with but they are worth while to see other points of view. The post I found eye opening was "The Google Life": how Google keeps employees by treating them like kids"
The latest aquatic forum I joined, this one has great people!